The functions of buttons on a smart key are similar to the remote keyless entry. Pressing the button in the front outside door handles with all doors (and trunk) closed and any door unlocked, locks all the doors (and trunk). The hazard warning lights blink once to indicate that all doors (and trunk) are locked. The button will only operate when the smart key is within 0.7~1 m (28~40 in.) from the outside door handle. If you want to make sure that a door has locked or not, you should check the door lock button inside the vehicle or pull the outside door handle. • The smart key is in the vehicle. • The ENGINE START/STOP button is in ACC or ON position. • Any door except the trunk is open. 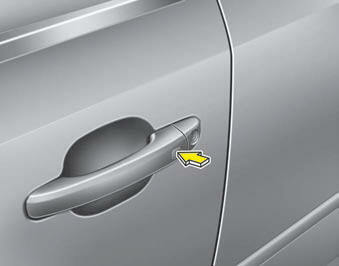 Press the button in the front outside door handles with all doors (and trunk) closed and locked, unlocks the driver’s door.The hazard warning lights blink twice to indicate that the driver’s door is unlocked. All doors (and trunk) are unlocked if the button is pressed once more within 4 seconds. The hazard warning lights will blink twice to indicate that all the doors (and trunk) are unlocked. The button will only operate when the smart key is within 0.7~1 m (28~40 in.) from the outside door handle. When the smart key is recognized in the area of 0.7~1 m (28~40 in.) from the front outside door handle, other people can also open the door without possession of the smart key. When all doors are locked, if you are within 0.7~1 m (28~40 in.) from the outside trunk handle with your smart key in your possession, the trunk will unlock and open when you press the trunk handle switch. The hazard warning lights will blink twice to indicate that the trunk is unlocked. Also, once the trunk is opened and then closed, the trunk will be locked automatically. • If, for some reason, you happen to lose your smart key, you will not be able to start the engine. Tow the vehicle, if necessary, and contact an authorized KIA dealer. • A maximum of 2 smart keys can be registered to a single vehicle. If you lose a smart key, you should immediately take the vehicle and key to your authorized KIA dealer to protect it from potential theft. - You keep the smart key near a mobile two-way radio system or a cellular phone. When the smart key does not work correctly, open and close the door with the mechanical key. If you have a problem with the smart key, contact an authorized KIA dealer. 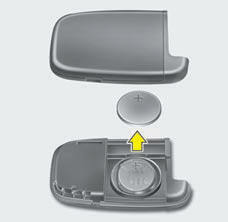 The trunk lid lock knob located in the trunk is used to prevent unauthorized access to the trunk. 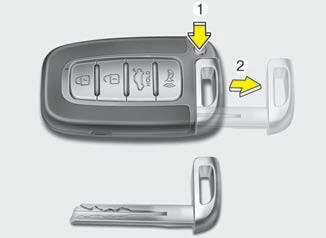 To activate the trunk lock system so that the trunk can only be opened with the mechanical key, perform the following: 1. Depress and hold the release button (1) and remove the mechanical key (2). 3. Set the trunk lid lock knob to LOCK position. When leaving your keys with a parking lot attendant or valet, perform steps 1 to 4 above, remove the mechanical key from the smart key and leave the smart key with the attendant. In this manner the smart key can only be used to start the engine and operate door locks. To release the trunk lock feature, open the trunk with the mechanical key and set the trunk lid lock knob to UNLOCK position. 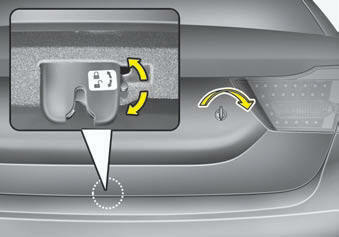 In this position the trunk will open with the trunk lid release lever or smart key. The circuit inside the smart key can have a problem if exposed to moisture or static electricity. If you are unsure how to use your smart key or replace the battery, contact an authorized KIA dealer. • Circuits inside the smart key may develop problems when dropped, exposed to moisture or static electricity. • If you suspect that your smart key might have sustained some damage, or you feel your smart key is not working correctly, contact an authorized KIA dealer. 1. Depress and hold the release button (1) and remove the mechanical key (2). 2. Turn the key toward the rear of the vehicle to unlock and toward the front of the vehicle to lock.